If you’re building your houses to high-performance standards, the last thing you want to do is overlook the little things. The proper ventilation of the bathroom is one of them. Everyone can agree that venting the bath is a good idea. The question, however, is how to do it correctly. There’s more to it than you might think. First, you must choose the right size exhaust fan. At a minimum, the fan should be rated to move 1 cubic foot of air per minute (CFM) for every square foot of space. For bathrooms larger than 100 square feet, HVI suggests CFM ventilation rates based on the number and type of fixtures in the bathroom: 50 for a toilet, 50 for a shower, 50 for a bathtub, 100 for a whirlpool. Placement of the fan also is a big consideration. Fans should be located over or near the shower or tub and in an enclosed toilet, HVI advises. “With windows closed, exhausted air will be replaced by makeup air from adjacent rooms or forced air system registers,” HVI notes on its Web site, adding that exhaust points should be “located away from the supply, thereby pulling the supply air through the room.” In addition, bathroom doors need to have at least a ¾-inch clearance from the floor to allow makeup air to enter. Spaces with ceilings measuring more than 8 feet may require additional ventilation. Lastly, fans should remain on for 20 minutes after use of the bathroom, though home buyers seldom do this. 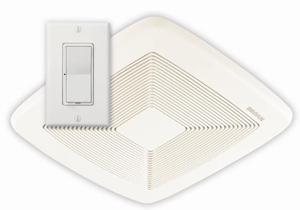 For this reason, manufacturers such as Secaucus, N.J.–based Panasonic and Hartford, Wis.–based Broan-NuTone are offering products that automatically activate either through moisture sensing or motion detection so homeowners will not have to worry about it. Follow these steps and your baths will remain fresh and moisture-free for years to come. Step Outside: Unlike most vent fans, the motor for the PBW110H mounts on an exterior wall, so homeowners will not hear the unit when it’s activated. 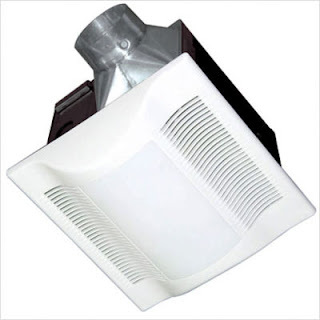 It features insulated flex duct and uses either a 50-watt halogen or a 14-watt compact fluorescent light. The unit is rated at 110 CFM, and the housing measures 5 1/2 inches. Fantech. 800-747-1762. /http://www.homeproductsinc.com/. Sense and Sensibility: SmartSense is an ingenious ventilation system that connects all of the company’s Ultra Silent fans installed throughout the home. A master control monitors the manual usage of the fans and automatically activates and adjusts the units to achieve optimal ventilation. Fans are available at 0.3 and 0.7 sones and are rated at 80 and 110 CFMs. Broan-NuTone. 800-558-1711. http://www.homeproductsinc.com/.